There's alot of cretins out there, and nothing can stop them form hoppin'. Some of them are not just diehard RAMONES-Fans, but diehard collectors - just like us. We would like to introduce you to some of them, hoping that you'll enjoy their sites and their approach on keeping the RAMONES flame burn for generations to come. 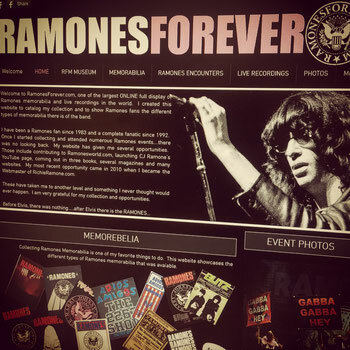 The official RAMONES website, including many never before seen photos and videos, latest news and a list of all RAMONES shows. If you look for a the classic RAMONES shirt and other obscure and not so obscure merchandise, this is where you will find it. March 17, 2017, CJ RAMONE will release his third solo album via Fat Wreck Chords, an album that proves once again that the former RAMONES bassist is not just a great performer and front man, but also a very talented songwriter and solo artist. For the past few years, CJ has worked hard on hIs own career, releasing albums and playing shows all over the world. In 2017, he tours so much, one could think he went straight back on the road with the RAMONES. After having vanished for more than two decades, Richie Ramone returned to the RAMONES camp and few years ago with his solo album "Entitled", and played countless shows as front man and drummer of his new band. 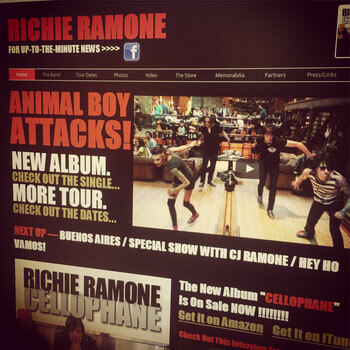 Richie, who wrote RAMONES hits like "Somebody Put Something In my Drink" just released his second album "Cellophane" and continues touring through South America, Australia and the UK. Ian Harper was one of the first people to dedicate the band a website - focusing on the things he loved the most: Johnny's guitars, and Dee Dee's basses. Ian gives an insight in the technical aspect of the RAMONES, documenting all details with the photos he took himself before, during and after shows and soundchecks. That already is pretty cool. But guess what: Ian is also the guy who designed Johnny's famous Yoo-Hoo-shirt! 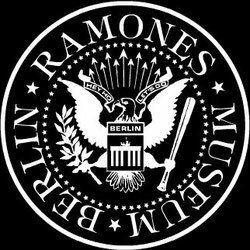 Gaston Sanchez from San Diego/California, is not just another crazy Ramoniac, he also owns one of the most extensive and detailed collections of RAMONES memorabilia. Over the past few years, Gaston obtained countless shirts, flyers, posters and all kinds of RAMONES rarities that now flood the walls of his home - a true RAMONES museum that makes us drool. 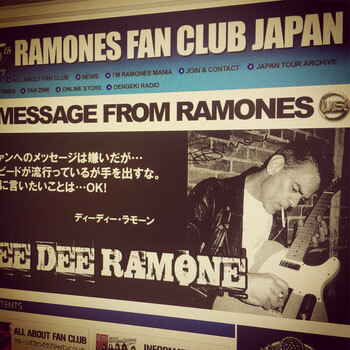 RAMONES FC Japan just celebrated it's 25 years anniversary, congratulations for that! In those 25 years, Yuki and all the other Japanese fans did not only support the RAMONES in Japan and all over the world, they also published their own fanzines, created their own RAMONES logo and help CJ and Richie with the logistics of their Japanese tours. 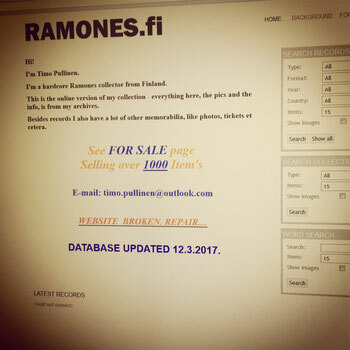 Timo Pullinen is another diehard RAMONES fan, and just like Gaston and us, Timo has an archive of RAMONES memorbilia you should check out. Timo has all the RAMONES shirts and collectibles, but he also has pretty much all versions of RAMONES vinyl, too: LP's, 7"es, test pressings, the whole lot. The best thing is: Timo sells some of his items! So if you don't want to buy fakes on ebay, get the real stuff from him. Without the help of the Italian Fanclub, we would never have gotten any closer to the RAMONES than the stage barrier. 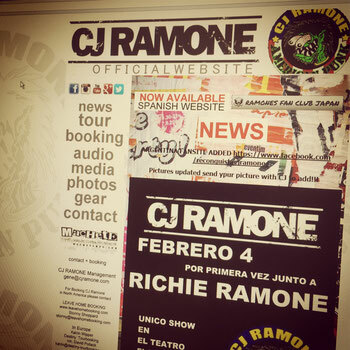 To this day, the Italian fans are the most dedicated RAMONES fans, organizing RAMONES events, festivals or running bars! 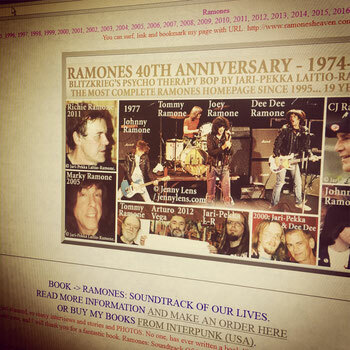 Two of them, Marco and Martino, dedicated a book to the RAMONES, focusing on posters and tickets for their live shows, t-shirts and much more! 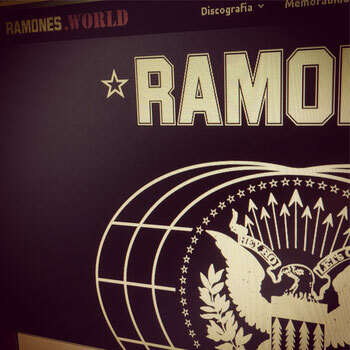 Everyone knows Jari-Pekka and his website, dedicated to the RAMONES and their side projects. If you want first hand RAMONES news, you'll probably find it here. Jari-Pekka is also a collector, but he is not into RAMONES memorabilia too much, but more into stories related to the band. Some of those he captured in his numerous books about the RAMONES, filled with quotes from bandmembers, their friends and countless musicians from all over the world. 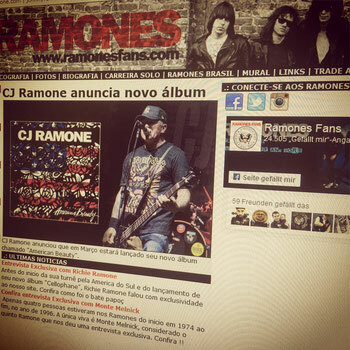 For all the portugese speaking pinheads out there, you should check out ramonesfans.com, a great site from Brazil with an even better Facebook feed. 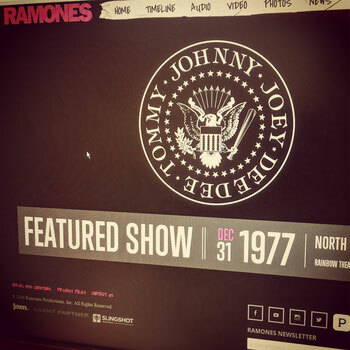 We love their RAMONES .gifs and all the daily posts with links to the RAMONES past, present and future. 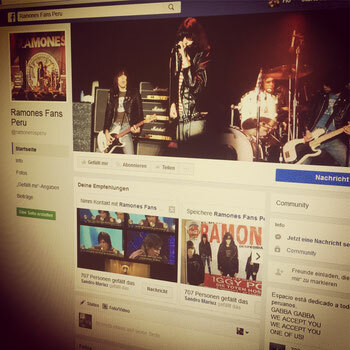 FIND RAMONES FANS ON FACEBOOK! Many RAMONES fans use FACEBOOK connect with fellow cretins around the world, and some of them have their own Facebook-Fan-Sites. We don't know what happened to the World's Smallest RAMONES museum in Dublin.